Please refer to our stock # 1273 when inquiring. 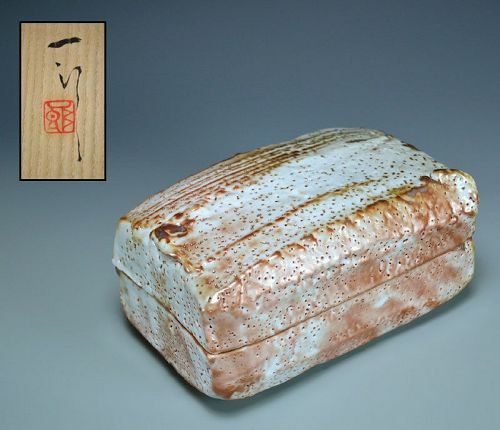 A covered box in red tinged shino glaze by Hori Ichiro enclosed in the original signed wooden box titled Nezumishino Tobako. The pin-holed thick white glaze appears to be licked by the shadows of the flames, and on one side the artists finger prints are clearly visible as four molten points. The way the reds move like vapor across the surface it is as if it is still on fire. It is 10 inches (28cm) long and in excellent condition.